Star Rapid talks about the foundations of metrology and the special case of measuring how heavy something is. This lovely platinum/iridium cylinder is a kilogram. In fact, it’s the kilogram, as kept under very controlled conditions at the International Bureau of Standards near Paris, France. It forms the basis for the standard unit of mass, against which all other measurements of mass and weight are calculated. Clearly this is significant in all endeavors involving science, technology and commerce, so knowing the exact weight of something – of anything – is dependent on the precision of this object. But it turns out that it’s not so easy to say what the mass of something is. This has compelled some researchers to create what may be the most perfect object ever made. First, a word about how we measure things. What Are The Essential Units Of Measurement? The meter. The standard unit of length, this is now defined as the distance that a beam of light travels in a vacuum in approximately 1/300 millionth of a second. The second. Now defined as, well, get ready for this. Take a radioactive atom of cesium-133. It vibrates at very regular intervals. When it does so about 9 billion times, you’ve got yourself a second. The candela. How bright something is. Measured as the amount of radiant energy coming from a black body at a specific frequency. The mole. The base unit for quantity. It’s the number of atoms in .012 kg (or 12 grams) of Carbon 12. The kelvin. The unit for temperature. It’s roughly 1/273.16 of the freezing point of water. The ampere, the unit of electrical current. It is calculated as the amount of current flowing through two parallel wires that are one meter apart and which produces a fixed force (measured in newtons) between those wires. The kilogram, which is the mass equal to that of the international standard above. 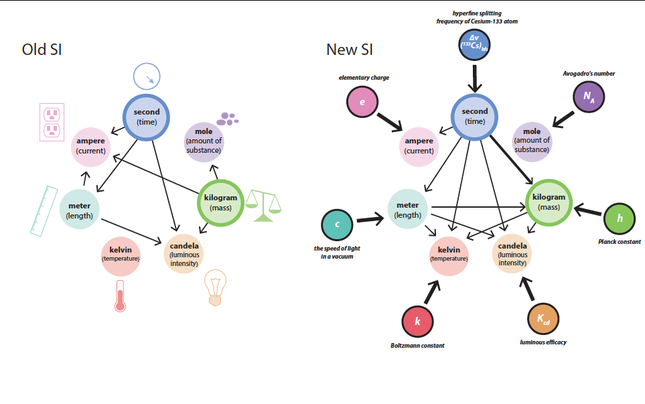 This group is collectively known as the International System of Units, or SI. The first six base units are linked to absolute physical measurements that can be reproduced by anyone, anywhere and at any time. As long as the initial conditions are met, these measurements will remain constant forever and throughout the physical universe. 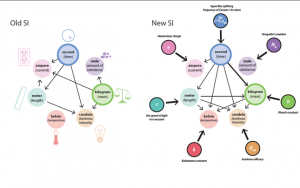 One major challenge is that the units are somewhat related to one another. 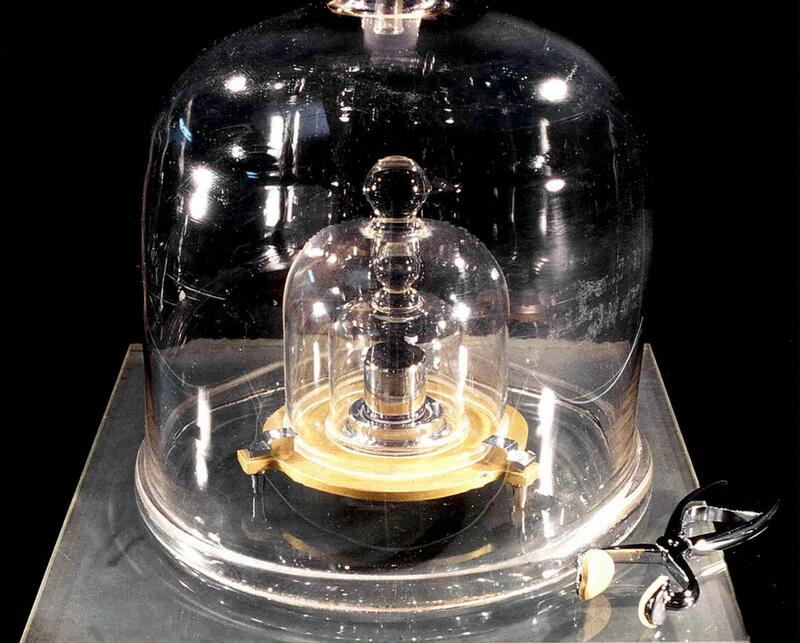 And the kilogram, unlike the other units, is not based on a physical constant but on a rather arbitrary mass loosely derived in the 1800’s from one cubic deciliter of water. But if the kilogram remains stable and reliable, then everything is fine, right? No one knows how this is happening. But as the standard kilogram gets more massive it effects all measurements based upon it. In fact, it suggests an almost existential dilemma – the inability to truly know what we think we know. The kilogram is not a constant, so efforts are under way around the world to find another way to establish the foundation of mass in absolute terms. Gravity is the force that acts upon objects of mass. But the force of gravity changes depending on where you are and what’s around you. It will be different during a high tide, or at the top of a mountain. And the mass of the Earth itself is changing all the time too as it constantly collects dust and debris drawn in from outer space. Therefore any measurements relying on gravity are at best approximate. Is there a better way? The Avogadro Project is an international effort led by the Australian Centre for Precision Optics. 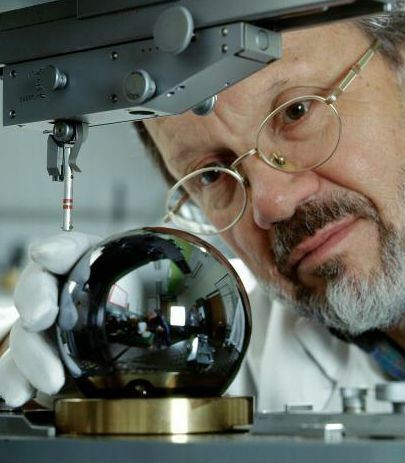 Their aim has been to make a sphere of pure silicon that will serve as the new standard. Silicon is highly stable with a regular atomic structure. Assuming a “pure” ingot of silicon, and knowing the atomic mass of silicon, it should then be possible to calculate the exact mass of the object if its size (volume) is precisely measured. How to measure the volume with absolute accuracy? Make the most perfect sphere ever created. The silicon crystal was first refined in Russia and grown in a laboratory in Germany, after which it was then shipped to Australia where a master optician slowly lapped it over a period of several months. It was constantly checked using advanced optical interferometry and any imperfections polished out by hand. When finished, the sphere was measured around its circumference at more than sixty-thousand points and its concentricity found to be accurate to within one atomic orbit. Put another way, if the sphere were enlarged to the size of the Earth, its highest and lowest spots would be only a few meters apart. The researchers still must make some assumptions about the purity of the silicon and to ensure it has not absorbed any foreign matter, like water. It would then be possible to simply calculate how many silicon atoms it takes to make a perfect sphere 93.6mm across. This will then be the final, universal and constant definition for a kilogram, pending international agreement. The science of metrology is a specialized discipline that probes the limits of physics and chemistry on the small scale. 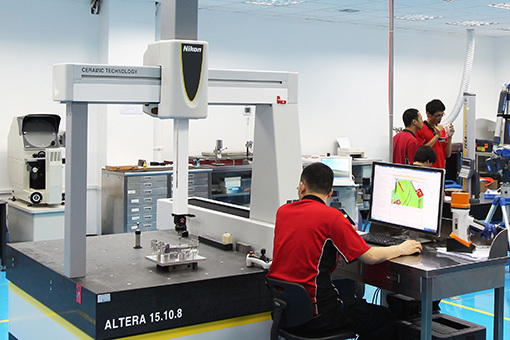 At Star, we use many sophisticated instruments and techniques to assure the purity of incoming raw materials and also the accuracy of everything that we make with machine tools. As new and better equipment becomes available we will employ it, but you can see what we have now right here. And when you’re ready to get started making your perfect project, contact us for a free quotation and project review.